Staying Her: A Transgender Romance - Frock Magazine for crossdressers, transvestites, transsexuals and transgender people everywhere. Oh, and Drag artistes too! My goodness, what a delightfully refreshing read this was. It started as one thing, shifted into another, and ultimately revealed itself to be something else entirely. 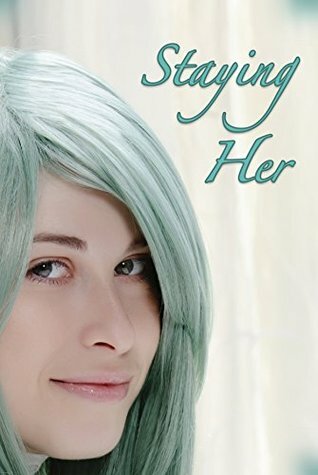 Although Staying Her: A Transgender Romance does suffer from some of the more exasperating aspects of the genre (I will touch on those in a minute), it was everything I could have asked for in a transgender romance. My one stumbling point with Holly Sharp’s tale is the level of superficial glitz-and-glamour involved, which seems more suited to soap operas than the romance genre. The opening chapters are quite literally all over the place, taking our characters from one exotic locale to another, indulging in a free-wheeling party lifestyle of which most of us can only dream. I get the appeal, and I eventually settled in enough to make sense of it, but I found it a very jarring sort of introduction and had trouble understanding who these people were and how they connected. That trope element aside, I loved the characters, and I really loved the slow, gradual development of the central love triangle. James is a genuinely good guy who allows himself to be placed in an awkward sort of situation. Sure, he makes mistakes, and he could have been more open about his feelings with those around him, but I appreciated the way he stumbled through navigating his emotions. He doesn’t realize what he’s missing in his life when he strikes up a friendship, and the way it develops is entirely natural and innocent. Skye, his girlfriend, I had issues levitra with – especially as her shallowness and selfishness became more and more apparent. Yes, she has her heart broken in what I can appreciate is a difficult fashion, but I never really liked her, and could see she was not the right partner for James. She, more than anybody in the book, belonged in that soap opera world that I found so exasperating. Kirsty, on the other hand, I absolutely adored. The way Sharp develops her character is fantastic, slowly taking her through an evolution of gender, friendship, identity, and love. She starts out as somebody whose gender is very much in question, a character who has made no commitments or promises as to their identity. She is a vulnerable soul, and I am sure many will find fault with her for inserting herself in a relationship, but you have to appreciate how desperate she is to be accepted. I was so invested in wanting to see her happy that, I admit, I found it a bit easier to make excuses in her situation. There were times where I was not at all sure where the story was going, and the ending might seem a little too perfect, but this is a romance, and we all want our happily-ever-after. Staying Her is the most thoroughly enjoyable transgender romance I have come across in ages, and I am anxious to find time to reconnect with James and Kirsty again in Reckoning. Next articleWhy does the world need a Transgender friend?